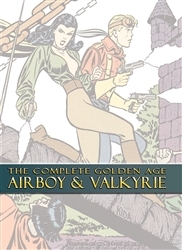 From the pages of Air Fighters Comics and Airboy Comics comes The Complete Golden Age Airboy & Valkyrie HC. Inspired by Milton Caniff’s Terry & the Pirates, Airboy and Valkyrie had a love/hate relationship that brought tension and drama to their stories. The Fred Kida stories collected in this volume inspired comic greats such as Alex Toth. For the first time, their complete adventures will be digitally restored and reprinted in one volume. Collects Air Fighters Comics V1 #12, V2 #2, V2 #7, Airboy Comics V2 #12, V3 #6, 12, V4 #10, V9 #2. Introduction by Timothy Truman.